Hello! Welcome to Joy De Vivre! By definition joie de vivre or French [ʒwa də vivrə] is the joy of living; enjoyment of life. Wanting to encompass all things that make me happy, I thought enjoyment of life would be a great definition of what I wanted my blog to be. Joy is my middle name so it was a perfect fit! Joy De Vivre covers a wide range of topics. My love of travel, interior design, Disney, fashion and other random musings will often pop up. I also hold no responsibility for what my pointing out of beautiful shoes may do to your budgets! 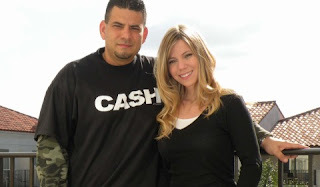 My husband Gabe...lover of Johnny Cash and video game connoisseur. And that is me..Heather. Nice to meet you! Our fuzzy son Barkley...lover of chew toys and anything edible.